Lake Kezar Golf ClubRated #1 By the New England Golf Guide for the Best Golf Value!!! We are nestled in the foothills of the White Mountains of NH, this par 72 gem combines a 1924 Donald Ross Design with a 1998 spectacular and breathtaking back nine. The challenge and beauty of the brooks, ponds, stonewalls and majestic Eastern white pines are never ending. Lake Kezar Country Club in Lovell, Maine offers four sets of tees on every hole to accommodate any level of golfer. With superior public accessibility and discounted group rates, this golf course has become the destination for many corporate, group and family outings. We don’t have houses, condos, tennis courts, or swimming pools, we just have Cadillac conditions at Volkswagen prices. If you are golfing in Northern New England, come discover the best kept secret in Western Maine. View information about our golf course designed by world renowned golf architect, Donald Ross. 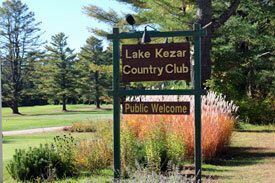 Purchase Lake Kezar Country Club Gift Certificates right here. Great course, we played the back nine, interesting holes.